Working with clients I often hear the same questions about where to go for WordPress hosting, domain registration, theme choices and email marketing. Here are some of the products I use for my own business and when working with clients. Full disclosure – for some of the products listed here I am an affiliate partner which means if you click on one of the links and sign-up for their product or service I may be compensated for recommending it. Thank you! 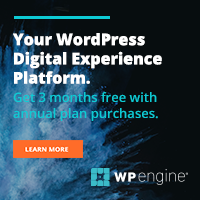 www.wpengine.com – A premium web hosting company, well worth the $29 per month for one WordPress site. They provide very fast site speeds, excellent support, and strong security for your site. This site is hosted with WP Engine. www.godaddy.com – One of the most affordable for domain registration and hosting, especially if you plan to register multiple domains. They do not have a toll-free number for support, but offer 24/7 phone support and extensive on-line help. I started with GoDaddy years ago and many client sites are hosted with them. What can I say? I’m a racing fan. www.wordpress.org/themes/ – Many free themes and some premium themes are available with the option to filter searches using specific design preferences. www.headwaythemes.com – A drag and drop theme that allows you (or me for you) to create a custom theme design. This site is designed using Headway Themes. www.constantcontact.com – Email marketing, surveys and social media campaigns, with a free 60-day trial. I’ve been using Constant Contact for more than 5 years and their product always works. The support is excellent, with many free marketing resources and tutorials readily available on their website.